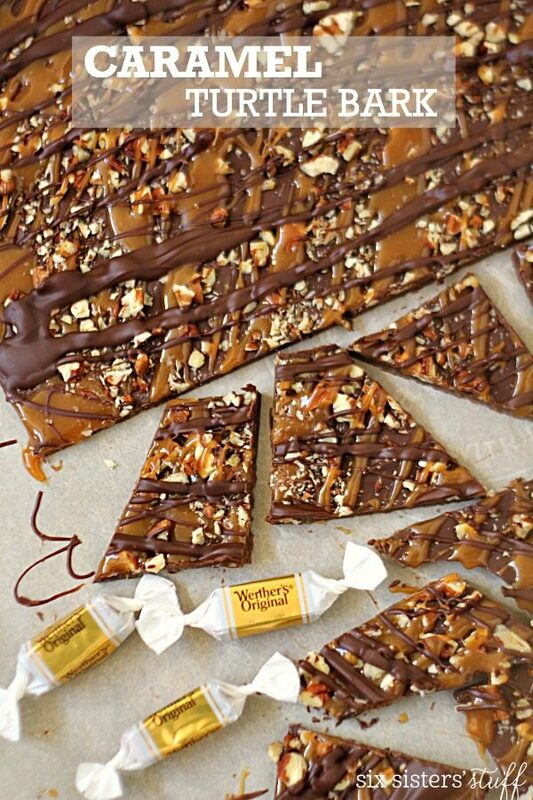 This Gooey Caramel Turtle Bark is a holiday must have. I even make it for my husband's birthday every year, at his request. It is the perfect combination of chocolate and caramel. You will love this one. Although this post is sponsored by Werther’s® Original®, all thoughts and opinions are 100% my own. Thank you for allowing us to share with you brands that we love to keep our blog going. I think that I have found my new favorite holiday: National Caramel Day. I had no idea that this day existed every April 5, but I will now be adding it to my calendar and celebrating each year. This year, I wanted to celebrate by sharing this caramel recipe with you. Werther’s knows how to celebrate National Caramel Day. They set up this huge bowl of caramel at Times Square in New York City and invited people to come scoop some caramels for themselves and their friends. That’s my kind of holiday. When it comes to caramel, I automatically think of Werther’s – my sisters and I grew up with those delicious hard candies that literally melted in your mouth. 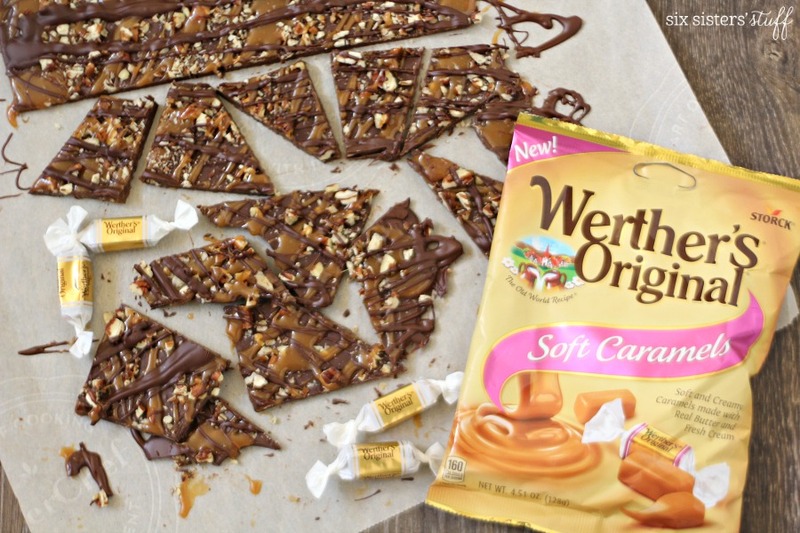 Werther’s has now expanded it’s brand to include my new caramel favorite: Werther’s Original Soft Caramels, and they aren’t kidding when they say soft. They are so smooth and delicious, I couldn’t help but sneak a few while I was making this yummy dessert. I love that Werther’s caramels are made with real butter and fresh cream and I knew that these soft caramels would melt up nice and gooey. I also knew that if I drizzled this caramel over a dark chocolate bark, I would have a match made in heaven. This dessert literally comes together in a matter of minutes and is great when you need a quick dessert that will impress anyone. Thank you Werther’s Caramels, for changing the caramel game. This Gooey Turtle Fudge is award winning. watch how to make another one of our favorite caramel inspired dishes? Did you know we have a Youtube Channel? We created it, just for you. We want to help you create a beautiful dish, that the whole family will love. We take you through each one of our recipes, step by step, and show you exactly how to make it. Each recipe is tried and true, so you can be sure your family is going to love it. Line a 15x10x1" cookie sheet with wax paper. Pour chocolate chips into a medium-sized bowl and microwave for 45 seconds, stir, then return to the microwave for 30 seconds. Stir until completely melted and smooth (you may need to throw it back into the microwave for another 30 seconds- it really just depends on the strength of your microwave). Pour melted chocolate onto prepared sheet. Using a flat spatula, spread chocolate out on wax paper until it's about 1/4" thick. Place unwrapped caramels and milk in a medium-sized bowl. Microwave for about 30 seconds, then remove and stir. Microwave again for 30 seconds, then stir until caramel is smooth and creamy (you may need to throw it back into the microwave for another 30 seconds so it can be super creamy). Drizzle melted caramel over chocolate, then top with chopped pecans. If desired, drizzle with additional melted chocolate. Place bark in the fridge for 30-45 minutes so that it can set up. When it has hardened, remove from fridge and use a sharp knife to chop into large pieces (or you can use your hands to break it into small pieces). 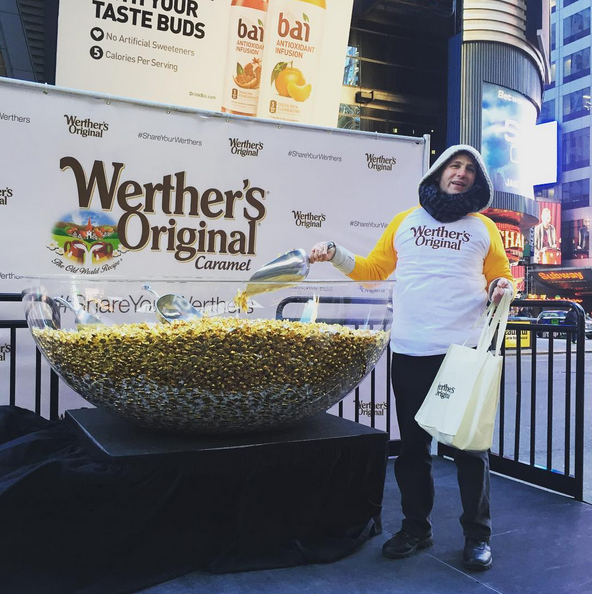 All varieties of Werther’s Original are available in grocery stores and retailers nationwide in several varieties, from hard, chewy, soft and filled caramels, to sugar-free caramels and even caramel popcorn. 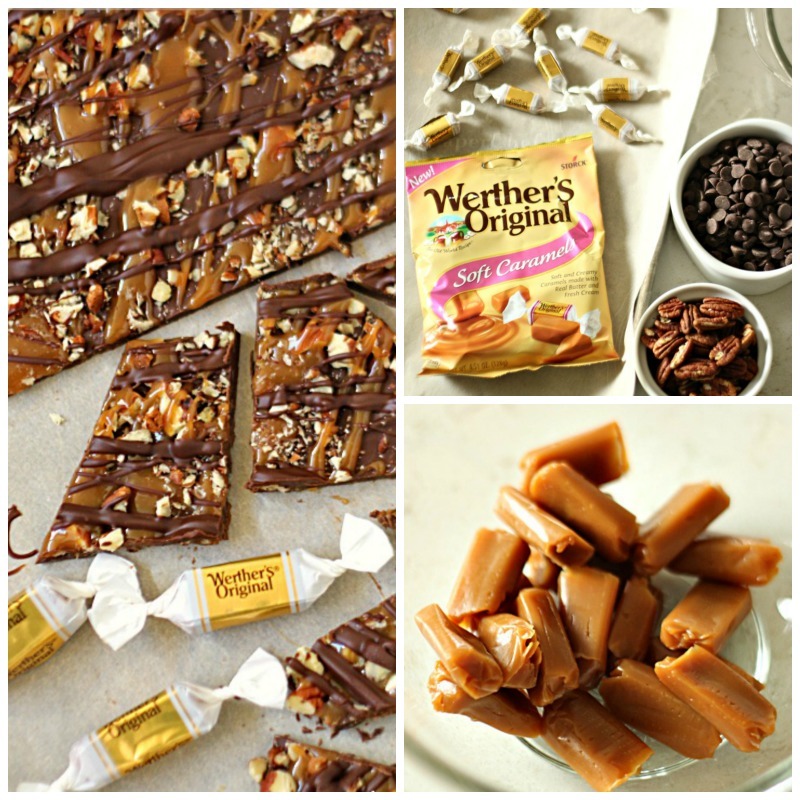 For more information, you can visit their website www.Werther-Original.us or on Facebook at Werther’s Original US. Thank you so much for this recipe. It saved me for Thanksgiving. Tuned out amazing! Oh no, I just bought everything except the wrong caramels! I bought the chewy ones, do you think it can still work!? Can't wait to try this, it looks delicioussss, thanks! 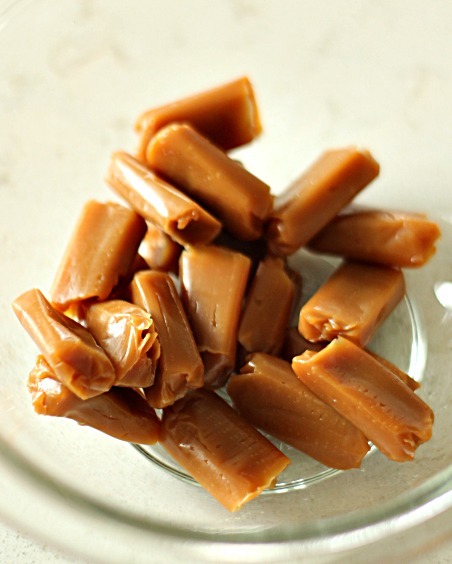 You need the soft caramels which are kind of chewy. Kraft caramels would work too. Hi love your blog! I'm definetly a fan! Question does the soft carmels stay soft on the bark when it's completed or does it get hard for making a struggle to chew after? Curious cause kraft carmels have done this in past recipes? The caramel sets up nicely but it is still soft. simply delicious, I use the caramel stated in the recipe. I am now making gift for my two BFF. How do you store yours? In the fridge? In a container on the counter? We store it in an airtight container.